I call compost: the garden gold and eco-paydirt. You can go and buy ready-made from your garden centre, or you can make your own. Making compost by recycling vegetable-based kitchen scraps and yard waste cuts down on garbage and more importantly – conditions and feed your garden soil. It’s easy to do and it will definitely make your garden better! Turn the pile frequently and keep adding coarse, dry material – like straw and shredded leaves. This will prevent bad odours. Compost that is too dry will break down slowly – you can avoid it by mixing in a few handfuls of soil and some moist kitchen scraps or coffee grounds. You will want to check weekly to make sure your compost is not too dry. 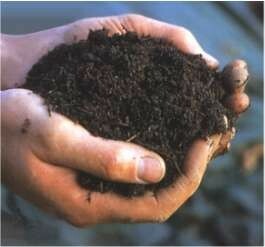 Here is a simple hand test for you: a handful of compost should feel like a wrung-out sponge. If the pile of too mushy or soggy, add dry materials. You can add things like sawdust or even dryer lint. Keep the pile uncovered (unless it it raining heavily) and keep checking it weekly. If you find that your compost pile is not decomposting, try this: Separate layers of fresh leaves or grass clippings by mixing in straw, hay (without seeds) of dry leaves. If large chunks are not breaking down, sift the pile through a screen or use a soil shredder. The resulting fine materials can be sued for a new compost heap. For best results, compost pile should be at least one cubic metre.If yours is smaller, turn the heap more often or mix in more materials. To keep pests away, do not ever add any meat to your compost – or fish, bones or fats. Cover food scraps with soil ot other carbon-rich materials and turn the pile weekly. Hope you have enjoyed this article and that it will help your gardenning efforts! Please share your experiences and send in your comments or suggestion – your participation is always welcomed! have been visiting ur site for several days. absolutely love your posts. btw i’m doing report about this topic. do you happen to know other sites or perhaps online forums that I can learn more? thanks a lot. Hi! Thanks for your kind words – and there is good information on :http://compostguide.com/composting-tips/ Hope you will keep visiting my website and hope to hear back from you again soon! So good to hear that what I do provides you with a bit of stress relief – we all need that at times! Hope you found the RSS feed!